This wedding was near and dear to us for many reasons. We got to watch Jordy grow up in our church family, she was always such a sweet girl and always had a smile on her face. Jordy entered our flower story on a hot summer day. Jordy and her mom stopped by our booth at the Hermiston farmer’s market and Mom let Jordy make her own bouquet. This led to Jordy helping us at market every Friday for the rest of the season. 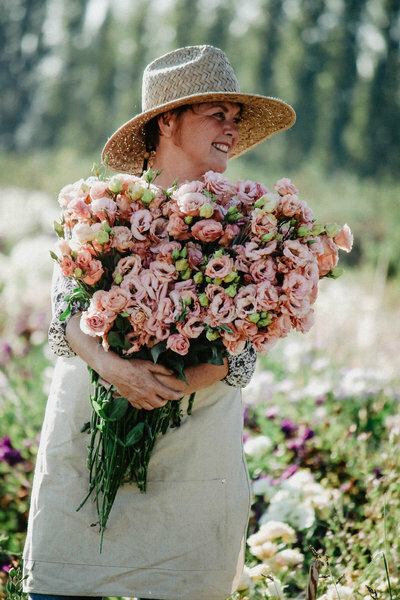 We had so much fun working with her and she soon shared our love of flowers. Jordy was a natural. She has babysat my kids and they formed a special bond with Jordy over the years. I was so honored when she asked all 3 of our kiddos to be ring bearers and flower girl. They were so excited, (unfortunately Nate never made it down the aisle, but he was very handsome nonetheless). We were equally honored to grow and design her florals for her. 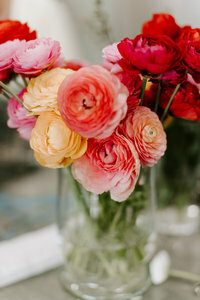 She LOVES dahlias and lisianthus were a must with subtle hints of burgundy and peach. Now, Patrick enters the story! Patrick and Jordy were friends first, I remember asking her each week if they were dating and she would just blush. Soon enough, they were dating, they made it through the long distance college years and now call Colorado home. They traveled back to their hometown of Hermiston to celebrate their marriage in our home parish Our Lady of Angels. The reception took place at Echo Ridge Cellars in Echo, Or. This was the most fun I have had at a reception in a long time! From the speeches to the dancing to the unique money dance. One of the groomsmen was an auctioneer by trade, so he auctioned off a dance with Jordy and another with Patrick. The guests were all involved and very entertained. My dad ended up with the highest bid….they started the music and it was “My Maria” which was one of the songs we danced to at my wedding! Everyone danced the night away and enjoyed celebrating Jordy and Patrick. We wish them many years of happiness!